Inventory We are a resale marketplace, not a box office or venue. Ticket prices may exceed face value. This site is not owned by Amphitheater at The Wharf . The Amphitheater at the Wharf in Orange Beach, Alabama is celebrating 10 years in business in 2014. Nestled in between Mobile and Pensacola the Wharf Amphitheater is close enough for lots of fans to make the drive. And if you do not like to drive your car you can even arrive by boat, Now that is something very few other venues can say. The Gulf shores of Alabama have hosted some great musical acts in the past such as Kenny Chesney, and Jimmy Buffett. With upcoming acts int eh 2015 season including red hot Florida Georgia Line, the summer will be hot in Orange Beach and the box office will be tested in ticket sales. 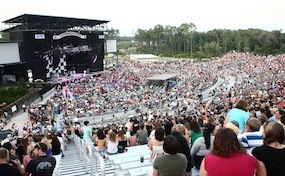 AmphitheaterOrangeBeach.com is not affiliated with any primary box office or supplier. We are a privately owned and operated business specializing in sales in the secondary market. To buy tickets for any The Amphitheater at the Wharf events in Orange Beach, Al simply click on the event of interest or call our operators at anytime.